Trumpets, horns, tubas, euphoniums galore! Blowing your lungs into a brass instruments creates a melody of sounds that are both aesthetically pleasing to listen to on their own and simultaneously instrumental to music bands as a whole. But that’s not the only great thing about brass instruments! Want to know who teaches Brass lessons at the Gray School of Music? All you need to do is click here. 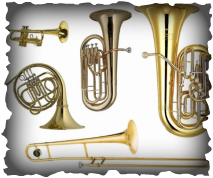 Not all brass instruments are made of brass. Some are made of other metals, wood, horn, or even animal bone. One example of the earliest brass instrument, a trumpet from the tomb of King Tutankhamun, still exists. Two trumpets were discovered in the tomb, one made of copper and one of silver. The main classification of a brass instrument is that you play by blowing through a mouthpiece to change the pitch, or note. With brass instruments, the sound starts at the lips. Their mouthpieces just help your lips buzz. ​Interested in learning to play or improve you skill set with the brass family? Call us today @ (310) 832-0519 or use the form fill located on the Sign Up Today Page and schedule a lesson. The Gray School of Music has been teaching brass instruments to students will all skill sets in the San Pedro and Rancho Palos Verdes area for decades. We have been a family owned and operated business since 1950.